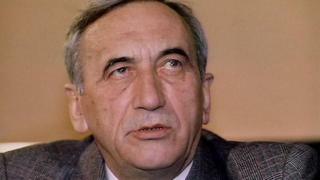 Poland's first prime minister after the fall of communism, Tadeusz Mazowiecki, has died aged 86. Foreign Minister Radoslaw Sikorski described him as "one of the fathers of Polish liberty and independence". Mr Mazowiecki was one of the architects of the "Round Table" talks, between communist leaders and opposition, paving the way for elections in 1989. The Solidarity movement's victory set a precedent for the toppling of communist governments across Eastern Europe. This climaxed with the fall of the Berlin Wall in Germany in 1989. Mr Mazowiecki held office for 15 months. He lost elections in 1990 following the implementation of a raft of stringent reforms to try to salvage Poland's stagnant economy. In 1992 he was appointed as the UN's first Special Rapporteur to the former Yugoslavia and reported on the atrocities there. Angered by the lack of international action, he resigned in 1995 after the fall of Srebrenica. In 2005, he became one of the founders of Poland's Democratic Party, and co-authored the 1997 constitution. He served as adviser to President Bronislaw Komorowski since 2010. Mr Mazowiecki was from a Polish noble family and studied law at Warsaw University. He was expelled from the communist-run Catholic PAX organisation in 1955, under suspicion of belonging to an internal opposition group. In 1957, he helped found the Catholic Intelligentsia Club. He also served as an MP for the small Roman Catholic party, Znak, under the communist regime - until he was expelled from his seat for demanding an explanation for the deaths of dozens of shipyard workers in 1970 in protests over price hikes. In 1980, he went to Gdansk to advise the striking shipyard workers in their talks with the communist authorities. The tense discussions led to a breakthrough, the creation of the first independent trade union in communist eastern Europe, called Solidarity. In 1981, he became the first editor of opposition Tygodnik Solidarnosc (Solidarity Weekly) magazine, which was banned when the communists declared martial law in December 1981. Mr Mazowiecki was arrested during the crackdown and was one of the last of hundreds of Solidarity activists released in December 1982. Mr Mazowiecki was a firm believer in a negotiated transition from the communist system. He took part in the Round Table Talks in February 1989, which led to the first partially free elections in the Soviet bloc in June of that year. He was appointed prime minister in August 1989 and oversaw the political and economic transition to a democratic and free market country. He holds the French Legion d' Honneur, and the Grand Cross of the Order of Merit of Germany.